Putting Northumberland to bed for over 25 years! Premium Mattresses at Discount Prices EVERYDAY!! Locally owned & operated and have been serving Northumberland for over 25 years. We are the exclusive distributor for Therapedic Sleep Products and the MLily Mattress Brand. With over 20 different models of mattresses on display in our showroom, we offer a great selection of Canadian-Made Mattress Sets, in Coil or Foam, medium, firm, or plush. At Sleep Made Simple you can “TRY Before You BUY”. You spend a 1/3 of your life in bed, make sure it is the RIGHT bed! Futons & Daybeds, Platform Beds & Storage Beds, Headboards & Frames. We also have a large selection of Bedroom Linens. We have sheet sets in Egyptian or Organic Cotton, Bamboo, Birch, Flannel, Micro-Fleece, Poly-Cotton, Sateen & Tencel. Available in Twin, TXL, Euro or 3⁄4, Double, DXL, Queen, King, or custom sizes with deep pockets or extra length. We have pillows in Goose-Down, Silk-filled, Australian Wool, Cool-Gel, Lavender, Eucalyptus, Latex & Memory Foam. While all customers can have different needs when it comes to a mattress, we can help find the right one for you! Find a great collection at Sleep Made Simple. If you are looking for furniture for children, teens, or adults, whether you want traditional, contemporary, or modern designs, we have affordable furniture that fits your lifestyle and adds some style to their sleeping arrangement. Wide selection of Sheet Sets, Pillows, Duvets, Quilts, Bamboo Blankets, Throws, Mattress Protectors, And More …..
Why sacrifice living space for an extra bedroom? Enjoy your space while also offering a comfortable sleep solution. We have a great selection of bedroom furniture available, over 150 sets in traditional, contemporary, or modern designs. we’ll help you browse the catalog here! 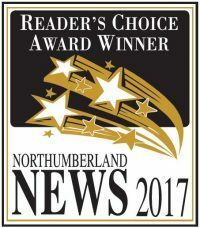 We are locally owned and operated, and proudly serving the Northumberland area for over 25 years. Words like “Integrity” and “Service” aren’t just catch phrases to bring you in the door. We have over 35 years of experience dealing with the public, and we include Integrity in all our prices, products, and services. When it comes to service, WE deliver, WE set up, and WE remove your old mattress. We don’t just sell you a mattress or furniture, we provide “Peace of mind”.